No honeyguide species depends entirely on beeswax as a food source, but all partake of it as a major food item, while a few species, among them Zenker's honeyguide (Melignomon zenkeri) and the yellow-footed honeyguide (Melignomon eisen-trauti), get some of their wax requirement by eating scale insects (Coccidae) that produce a waxy exudate that covers their dorsal surfaces. The digestive system of honeyguides produces specialized enzymes for digesting wax. Similar enzymes have been found in seabirds and other landbirds, although not in other Piciformes. All honeyguides supplement wax with insects and spiders, including bee larvae, ants, waxworms (Galleria spp. ), termites, flies, and caterpillars. Honeyguides will occasionally eat fruits and other plant matter. All honeyguides do some insect feeding by flycatching, snagging airborne insects in mid-flight. Honeyguides feed on beeswax directly, if the nest is accessible, by flying up to a bee nest, gripping the tree's surface alongside the outer part of the comb, and biting off and swallowing pieces of wax. The birds' hides are tough and parchmentlike, offering some but not complete protection against stings, and a ferocious onslaught of defensive bees can kill a honeyguide. Only two species of honeyguide partake in the behavior that has made the family famous, and given it its name Indi-catoridae—from the Latin for "to point toward"—deliberately alerting, then leading animals and humans to honey sources. 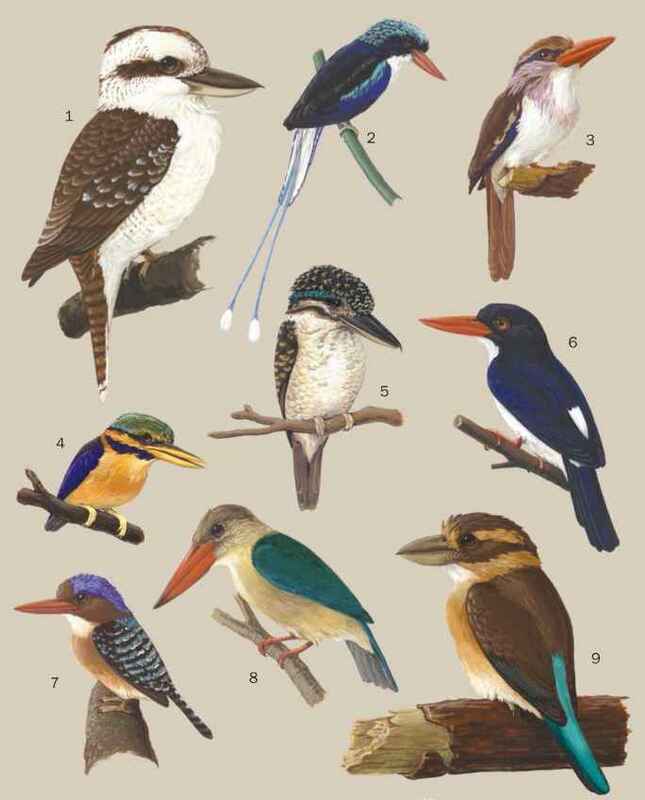 These species are the greater, or black-throated, honeyguide and the variegated or scaly-throated honeyguide. The greater honeyguide alerts an animal or human to a honey source by flying close to them and calling "churr-churr-churr-churr" or "tirr-tirr-tirr-tirr." Once it has attracted the attention of the partner, it flies ahead, stopping at intervals and calling. When both parties reach the nest, the bird circles near the bee nest, gives a short, toned-down "indication call," then perches silently in the vicinity of the nest and waits for the chunks of comb to fall. A honeyguide seems to know in advance where a nest is, most likely through regularly surveying its territory. H. A. Isack of the National Museum of Kenya, and H. U. Reyer of the University of Zurich conducted a three-year study to ascertain the truth of the honeyguide-human guiding relationship. In the mid-1980s, the two ornithologists followed Boran tribesmen through dry bush country in northern Kenya, searching for honey. The Boran claimed to have worked out an elaborate communication system with the greater honeyguide, with certain signals understood by both parties. The birds would indicate direction and decreasing distance of the nest, as the parties approached it, through flight patterns and calls. Isack and Reyer confirmed all this in the field. The birds signaled by calls and movements and perchings, the tribesmen by attracting the bird with special calls, then making noise as they followed the bird to keep communication going. Nearly all the nests the Boran reached with honeyguide help were inaccessible to the honeyguide, necessitating help from other quarters. In spite of the research of Isack and Rider, and others, some researchers have disputed accounts of honeyguides leading animals, leading humans, or leading at all, asserting that such accounts are not reliable. The favored animal accomplice is the ratel, or honey badger (Mellivora capensis), a medium-sized, powerfully built, omnivorous viverrid. The relationship between bird and follower is mutualistic; neither species needs the other to survive, but both benefit from the relationship. The honey badger, which is well equipped to deal with hive-raiding, gouges out hunks of comb, and the honeyguide helps itself to fallen pieces of comb with little risk of injury from bee stings. The ratel-honeyguide relationship has not been proven, but abundant testimony leans toward it being true. Humans who follow the honeyguides and gorge on the honey habitually leave the birds pieces of comb, as a reward and to keep the relationship intact. Most interesting, in relation to this custom, is that in suburban areas where people prefer sugar over honey, honeyguides have been reported to have lost the ability or the desire for guiding behavior.